This week at Blackville School many students showed their support during anti-bullying week by wearing pink on Wednesday. 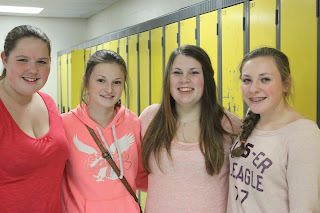 The students also participated in many anti-bullying week themed events. Middle and High school students started off the week with showing up to kind notes posted on everybody's locker, with saying such as "You're loving" and "You are kind". They also had events such as the K-12 drawing contest where students were asked to design a poster showing their support against bullying. The posters were to have an inspiring message about bullying. They also had Thank You-Thursday, where high school students were asked to make a new friend at lunch and bring their new friend to get pink lemonade. For more photos from this week's activities, click here.